A world class BASIC Compiler for rapid development of Microchip PIC® microcontroller based projects. Easy enough for the hobbyist, strong enough for a Pro. Professionals love it because it is designed to get things done fast. That’s the power of BASIC. Simple. Easy to use. Straightforward. With dedicated libraries/routines to make the difficult easy. It’s what we (and thousands of other companies) use to develop our own products. 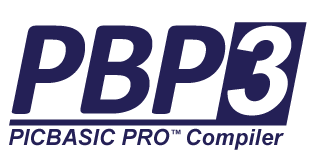 PICBASIC PRO has evolved over the span of 15 years, making it the industry standard in its field. It has become a professional-level development tool for embedded programmers, though it retains the easy-to-learn syntax that makes PBP popular among experimenters and educators worldwide.